Starting from the 1st April.we are going to be promoting our Level 1 walks, no more than 30 minutes gentle walk, no inclines etc. all led by a trained Walk Leader. They are ideal for people just starting to walk for the first time, getting over an illness or who have not walk for awhile, any one who needs a gentle start. 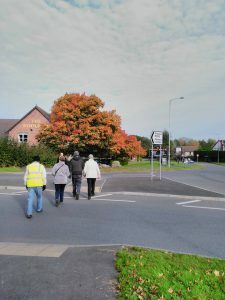 All you need to do is arrive 15 minutes before the walk starts, speak to the walk leader, wear comfortable shoes and clothes suitable for the weather. If you are unsure, why not come along and give it a try , it only needs one step!